Nose: Spicy, masculine aromas. The smell of tobacco, leather and cigars comes to mind. This transforms into spicy notes of clove and pepper. White and dried fruit appear, and a wonderful rancio. Palate: A complex Paul Giraud Cognac which has a long and elegant finish. The initial flavor is round and full-bodied. 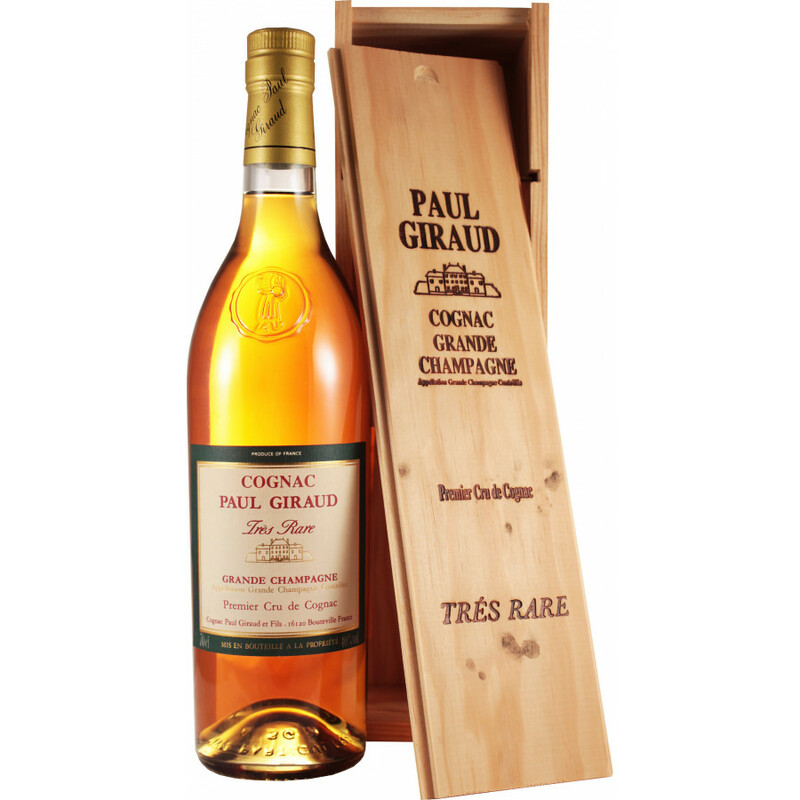 The Tres Rare Paul Giraud Cognac is a 40 year old spirit, making it the second oldest Cognac of the range. Its blend consists of the most supreme Grande Champagne eaux-de-vies of the collection, and is classified as a ‘Hors d’Age’ Cognac. This denominates the Tres Rare as one of the highest quality Cognacs available, due to its lengthy maturation process. The Giraud family have listened to the eaux-de-vie as they age in the cellars, waiting for the optimum moment across various generations to bottle it and make history. It is complex, as you would expect from this prestige terroir, and is the perfect hedonistic Cognac to ignite your senses. The Paul Giraud Cognac maison have built their reputation on preserving a fine heritage; on passing pearls of wisdom about the Cognac making process from one generation to the next, in the heart of the Premier Cru. In a region that is optimum for creating exceptional blends, the Giraud family authentically master their Cognac using a technique that does not descend from assemblage. Harvested by hand, the Ugni Blanc grape rises from the lime-rich soil of the region; overlooked by the castle of Montmorency-Bouteville. The Tres Rare is then aged in Limousin oak barrels for up to four decades. A fine Grande Champagne Cognac should be enjoyed neat; taking in its flavors on every level, and with each of the senses. Enjoy it with your fellow Cognac lovers, with a cigar. It is optimally served at around 16 to 17 degrees Celsius. The bottle is simple and slim like all of those at the small Cognac producer of Paul Giraud. Head to our blog to watch a video of Paul-Jean Giraud showing how the distillation process takes place in the world of Cognac. Please also check out our Paul Giraud Tresorraum Rare Decanter Edition. I decided on this cognac after reading about many of the cognacs available on Cognac-Expert.com, and after seeing the previous customer review. I like that Giraud was organic with no chemicals, was a small family owned cognac house, did not blend together different years, and that all the grapes were from Le Grand Champagne region and were Premier Cru. It seemed a way to taste a very “pure” cognac in a way similar to a single malt whiskey. I was not disappointed, as this is a great cognac. I agree with everything the previous reviewer said about the nose and flavors, especially the fudge or chocolate and toffee flavors, which are very noticeable. I also get some fig and fruit rind/citrus flavors. The initial taste on the palate is strong and vibrant, and continues through to the finish with great intensity, so this is a very powerful and flavorful cognac for those that appreciate cognacs with great character and intensity. If you’re looking for a soft, understated, and unassuming cognac, well, this isn’t it. This is a cognac to stand with the best single malts. It’s a class act in every way. OBOY what a positive surprise this was. Tres Rare is golden light color, it’s an excellent and lovely Cognac which tells us that color of the Cognac has nothing to do with its age or quality because this one is just superb. This is a 40 years old Cognac, its blended until perfection using pure vintage Cognac and not blending from different years, that’s my understanding. On the nose its very soft but on the palate it’s an incredible complex Cognac done by a master of the old sort. The nose and palate/taste brings memory of some light spices like pepper, but also vanilla, toffee/fudge, banana and wood. The finish is warm and smooth very pleasant and it’s a long-lasting one, almost like I’m going to hold on to it for the whole evening. I’m going to enjoy this one, highly appreciated master class Cognac, but trust me I’m going to purchase another one and put away in my cellar for the next years to come.